Social Share Buttons on Landing Pages: Keep or Throw? Viewing Post: Social Share Buttons on Landing Pages: Keep or Throw? Social media is no longer a craze. It’s a necessity, and companies are seeing the true impact social sharing has on a brand’s success. With this rise in social media use, we’ve seen the social share buttons trend skyrocket. These buttons can be found on individual blog posts, email campaigns, and now landing pages. But are social share buttons good for your landing page conversions? Let’s first take a look at the psychology behind why a company might use social share buttons in their PPC campaign. Marketers might assume their product or service is so revolutionary, visitors will be more than happy to share it with all of their friends. Thumbs up! Or maybe, just maybe, they believe social sharing could result in their landing page going VIRAL. What do A/B test results show? Take this case study from Taloon.com. 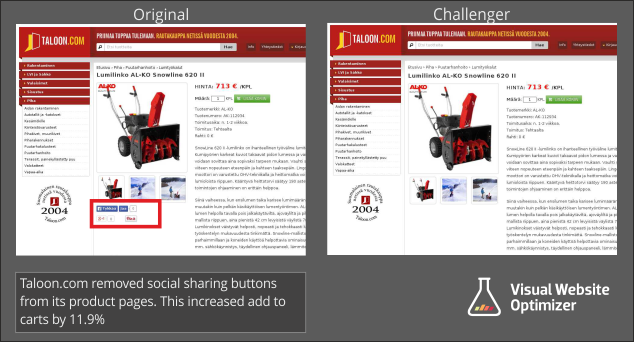 Removing the social share buttons on their landing page increased conversions by 11.9%. This is because visitors were directed to ONE option: add to cart. They weren’t distracted by if they should share the product with their Facebook friends. And a pin it button? Forget about it. Here is a case study from Kuno Creative. They removed the social share buttons from their ebook landing page and it raised conversions by 18%. Look at the numbers by each social share button. Zero. Thumbs down! Interestingly enough, Gainsight’s headline here mentions ROI. Just think about how much better their ROI will be when they ditch those social share buttons like Unbounce suggests. But wait, don’t I want social proof? Yes, but not negative social proof like the example above. There are other (better) ways to convince your visitors that your product is the real deal. Customer Testimonials – Who better to sing your praises than your current customers? If a visitor is on the fence about making a purchase, a well-written, value driven testimonial from a face they can trust could make the sale. Highlight Number of Users – Imagine if Buffer had a landing page where they didn’t mention that they had over 1.3 million users. They would be missing out on a HUGE opportunity to show their authority and credibility. If you have a high number of customers who have already invested in your product or service, show that. Highlight Users of Influence – It’s not just about the number of users but also who the users are. If Rand Fishkin, the Wizard of Moz, says he uses a product and recommends it, my trust levels go through the roof. Influencers can be great assets to your landing page social proof. Bottom line: don’t distract your visitors with too many options! 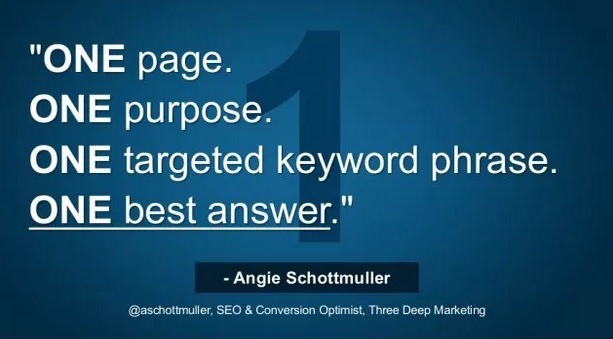 Focus your visitor’s attention on ONE call-to-action and you will increase conversions. Is it really as simple as that? Yes. Yes it is. What do you think of social share buttons on landing pages? Yay or nay?